AUSTIN, TX--(Marketwired - Jan 12, 2015) - RealMassive, the first data provider to deliver open access to the commercial real estate industry, today announces the launch of the Jacksonville, Orlando and Tampa marketplaces. 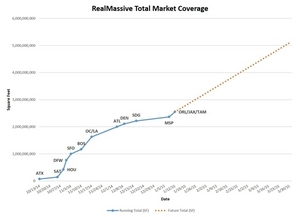 The addition of these markets brings the current coverage on RealMassive's platform to over 2.5 billion square feet. "We are thrilled to provide CRE professionals and tenants seeking commercial space in these three key Florida cities with access to RealMassive. Our expansion to Florida signifies the intensity of customer need for our products and that we are executing on schedule as we roll out across the country. We continue to improve on our ability to launch markets as we deliver on our mission to give control of CRE data back to the industry," said RealMassive's CEO, Joshua McClure. In addition, the company plans to launch Charlotte, Raleigh/Durham and Greensboro/Winston-Salem on Monday, January 19, 2015. The rapid series of market launches is enabled through strong partnerships with leading Commercial Real Estate (CRE) firms augmented by hundreds of researchers spread all over the country, logistically coordinated through a cloud-based framework. The framework was built and tested in the company's test market of Austin, Texas. "At Parkway we approach the market in creative and innovate ways in both our real estate strategy and in our use of technology. Keeping the rest of the market up to date on our availability in real-time is crucial, and RealMassive is a natural partner in Texas for us given the priority we place on technology in our strategy. The fact that RealMassive is quickly growing this platform nationally offers a good indication about both the national appetite for this approach and technology and the connection they are making beyond just one region in the delivery of this service," said Mike Fransen, SVP and Managing Director, Parkway Properties in Houston, TX. RealMassive's platform is packed with innovative technologies in a seamless, beautifully designed interface that is easy to use. In Austin, some of the more popular features include hosted real-time market surveys that enable property owners, brokers and tenants to collaborate throughout the search process; real-time notification when spaces come off the market; custom marketing channels; and CRENow, a service that enables syndication to Twitter and other online channels. To help us launch your market please contact our communications coordinator at Cassady@blastpr.com.